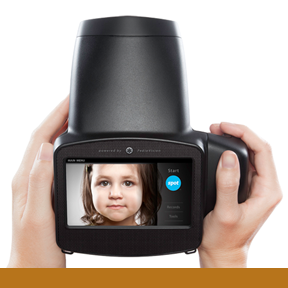 Spot is a fast portable easy-to-use vision-screening system designed to detect several ophthalmological issues in children from near-sightedness to eye misalignment. The typical user is a volunteer vision screener who is part of a school or community vision-screening event. The Wi-Fi-enabled handheld device makes vision screening as easy as using a camera; the touch-screen interface clearly displays results accurately and instantly.